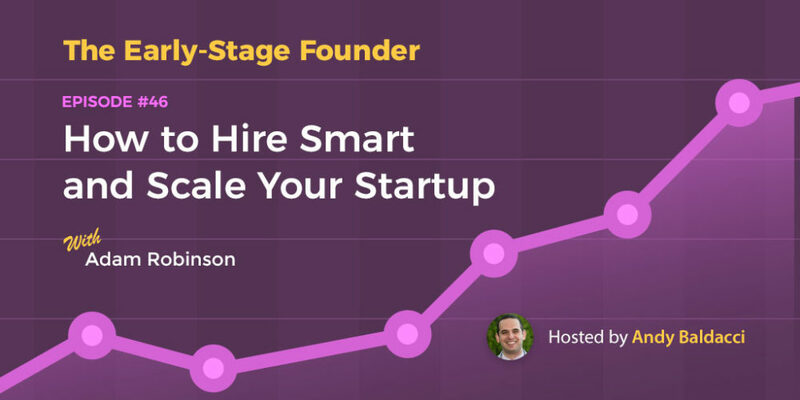 Today, on the Early-Stage Founder Show, I’m talking with Adam Robinson, the Co-Founder and CEO at Hireology, a platform that helps businesses manage their full employee lifecycle, from hire to retire. Adam is also the author of The Best Team Wins, a book that shows you how to build your business through predictive hiring. As your business grows, you’re faced with a new set of challenges and one of the hardest you’ll have to tackle is hiring. Adam is right, the best team truly does win, and if you want your startup to succeed, you’re going to have to get the right people in place to help you get there. In our chat, we’re going to dive into Adam’s step-by-step playbook that you can follow to hire the right person for the job and build your best team. (00:00) – The background on Hireology. (00:53) – Adam explains the services Hireology provides and how they got started. (01:30) – What Hireology looks like today. (02:48) – How to build your best team. (02:57) – Adam explains why hiring is often so hard to get right. (03:04) – Nobody ever teaches how to hire properly. (03:28) – Businesses don't treat hiring like a core and critical business process. (03:36) – A failure to implement management processes to ensure people are hiring properly. (04:20) – Adam walks us through the hiring playbook discussed in his book, “The Best Team Wins”. (04:44) – Step one: Considering your own brand as an employer. (05:25) – Three things your company brand should be offering. (05:27) – Defined career path. (05:57) – Work life balance. Flexible hours, remote options, collaborative technology. (06:54) – How Hireology has cultivated their own employer brand message. (07:01) – Telling an authentic story. (07:06) – Explaining what is in it for the employee besides money. (07:32) – Marketing potential career paths and pay potential. (08:22) – Reduced the amount of rules for employees. (08:25) – One rule: Be responsible and do your work. (08:56) – How early stage startups can address their employer brand message. (09:28) – The importance of defining your core values as a business. (10:03) – How an unlimited personal time off policy (PTO) can build trust with your employees. (10:15) – The power of total transparency. (11:32) – Step two: Implementing processes. (11:40) – Define your company's recruiting process and how it will be managed. (12:33) – Why having a process is so important. The ability to measure results. (14:21) – When to start prioritizing when to hire. (14:46) – The general rule of thumb. Do not hire for the position until the pain of not having the person in that role is so great that it's causing serious brain damage to the team or hampering growth or success of the business. (15:27) – Hiring utility players versus specialists. (15:59) – Where to find candidates. (16:34) – Will personal networks yield your best results in terms of retention and tenure? (16:58) – The worst way to find candidates. High volume, low quality, high time consumption recruiting. (17:11) – The best way to find candidates. Build your own employment brand through a dedicated career site linked to your company. (17:49) – Producing videos, sharply written copy. (18:38) – The right people will opt in. Similar to a warm sales lead. (18:55) – Discussing how search engines are now leveraging and inventorying job opportunities. (22:09) – Interviewing best practices. (22:15) – First step to take. Define what you're looking for. (22:54) – Difference between a job description and an outcome. (23:41) – Allows you to develop interview questions and determine a candidates relevant experience. (24:16) – How to develop your unique outcomes. (26:11) – Evaluating your candidates and employees. Measuring against the agreed upon outcomes. (29:07) – Understanding non-regrettable attrition rates. A healthy range for a company. (30:38) – What it means for your company if your attrition rates are too low. (31:19) – What to consider if your attrition rates are too high. (33:14) – Business challenges moving forward. (33:14) – What the future looks like for Hireology. (34:11) – To continue on their current growth trajectory. Continue executing on current processes and systems. (34:44) – What Adam sees as their biggest challenges. (36:10) – Efficient application of resources. (37:30) – Parting advice for founders. (37:30) – The advice Adam wishes he had received when he first started Hireology. (37:45) – Listen to your gut and trust your intuition when it comes to hiring. (39:06) – What do you spend too much time doing? (39:37) – What do you not spend enough time doing? (40:01) – What are you hoping to accomplish in the next quarter? (40:51) – What are the potential obstacles to those goals? Glassdoor: Resource Adam recommends CEOs use to measure employment brand quality and perception of company quality. If you want more valuable advice from Adam, or to get a copy of his book, you can check out his blog at TheBestTeamWins.com. He also has his podcast, “The Best Team Wins” linked up there, so you can review past episodes. And of course, for up to date information on Hireology, or to get in contact, head to their flagship site Hireology.com. Andy: 0:00:00.0 Today I'm talking with Adam Robinson, the cofounder and CEO at Hireology, a platform that helps businesses manage their full employee lifecycle from hire to retire. And Adam's also the author of, “The Best Team Wins”, a book that shows you how to build your business through predictive hiring. And Adam, these facts and figures might be a little out of date so correct me if I'm wrong, but since starting Hireology, you and your team have raised a little over 25 million in funding and grown the company, at least as of 2016 to number 94 on the Inc 5000 list. 125 employees and over 9 million in revenue. Is that about accurate? Adam: 0:00:38.0 Yeah that's all accurate. Andy: 0:00:38.9 Awesome. So in our chat today, we're going to dive into your step by step playbook that listeners can follow to hire the right person for the job and start building their best team. Adam, thank you for coming on the show. Adam: 0:00:51.2 Glad to be hear. Andy: 0:00:53.2 So, what exactly is Hireology and how did you get started? Adam: 0:00:58.0 Yeah, Hireology is a talent acquisition and retention platform for owner operated business networks. What that means, is we work with lots of owner operated networks like franchise systems and dealerships, like retail automotive or car dealerships, to help them be great at building their best team. 0:01:20.4 So we partner with brands and manufacturers who in turn push us into these networks and both sides win in that transaction. Andy: 0:01:30.4 And so I covered a little bit of kind of the bullet points of what the company looks like today, but in your own words, where are things at for Hireology right now? Adam: 0:01:40.4 Well, we are what I would call late-early stage or early growth stage company. So we're 125 employees, still pushing 100% plus year over year growth, but I've reached a point of scale where, you know we are moving towards, you know firmly growth stage business. We're heads down executing against the strategy that for us has been successful. 0:02:09.6 And we're staying innovative but we're not getting too fancy or complicated. We're doing what works and just trying to build the best, most valuable business we can build. Andy: 0:02:17.2 For sure, and so a lot of the listeners of the show are going to be in – are founders of stages – earlier stage startups that usually are going to be, maybe say between the 500K and one million ARR point 0:02:29.9 [Confirm], and so at that stage of a startup, a lot of times what I've seen, is you're going to have a small team of people who usually have similar motivations, vested interests, they're all hustling to get the company off the ground. Kind of find those first customers and really starting to build that path of growth from there. 0:02:48.9 But a lot of founders, what they underestimate, at least in my opinion, is how to handle – find the people to help them actually execute on that growth plan. 0:02:57.3 And so, just to get started with things, why is hiring so hard to get right? Adam: 0:03:04.5 Well hiring is difficult for most organizations to get right because nobody ever teaches you how to do this. You know, it's – your payroll is 70% of your cost structure, typically in any business. And I can't think of a more important or critical business process that gets less attention and rigour applied to it than does hiring. 0:03:28.3 And so, most people get it wrong for a couple of reasons. Number one, they don't treat it like the core and critical business process that it is. 0:03:36.1 And number two, they don't implement management process to make sure people are doing it the way it needs to be done. And so, it ends up being an ad-hoc process. You know, we talk about the wrong things in interviews, we wing it, we hire the person we like, we hope it works out. 0:03:50.4 And as it turns out, it works out maybe four or five times out of ten. And for most companies, that's a big problem. Very expensive. Andy: 0:03:58.5 Yeah, and I mean, especially at those very early stages. Making the wrong hire can be hugely detrimental to your growth. It can really slow you down. Not just in terms of getting the right culture fit, but there is so many other factors that go into play for choosing the right person. So, it really is of critical importance to these early stage companies. Andy: 0:04:20.5 And so, what I really want to dive into on this show, is kind of walking through some of the playbook that you talk more about in your book, “Best Team Wins.” And can you just get me started on this process? Like if I am a founder, say we have three or four people on the team, and we're really trying to get to, say ten, in the next year. Where do we even begin? Adam: 0:04:44.6 I would say the very first thing that you should think about is your own brand as an employer. And this is really step one for most businesses. I mean, if you're listening to this you certainly have a concept of your business's brand for whatever market you're selling into, product or service wise. 0:05:04.7 Well, what you need to understand is your employment brand is every bit as important as your business's brand. Your employment brand is what you stand for in the market to the labour pool as an employer. And, the strength, or lack thereof is going to dictate how successful or not you are in building your best possible team. 0:05:25.8 And so, what the research shows, is there are three things that you need to be offering and communicating very strongly through your employment brand that will make life a whole lot easier for you from a talent acquisition and retention standpoint. 0:05:27.8 Number one, defined career path. So, it's more than a job. What's in it for you if you come to work here. 0:05:44.9 Number two, pay stability. People know what they can make and know how that grows over time. So, it's full visibility into pay plans and stability over time, and earning potential. 0:05:57.4 And number three, there's really no such thing as work-life balance anymore, it's all just life. And providing a balanced life through flexible work hours, work from home permissions, you know, remote work possibility and strong collaborative technology are all very, very critical to building a brand as an employer of choice. 0:06:20.8 And so, contemplating how to do this right, I think step one is think about what you stand for. Because when you stand for something and have a strong culture, strong values and a strong brand, what happens is people opt in or out of wanting to work for you. 0:06:36.8 You want people taking a look at that brand going, “You know what, that looks like the place for me.” Versus people looking at it and going, “You know what, I really want nothing to do with this place.” And there's some interesting examples I can share with you if you like about, you know, what that looks like on a day to day basis. Andy: 0:06:54.9 Yeah, I'm curious to just ask what that looks like at Hireology. Like, how have you cultivated that side of your brand? Adam: 0:07:01.4 Well, for us it's all about telling an authentic story about what it means to work here. And we really do try to hit on those three things I just mentioned. 07:06 Number one, what's in it for you. If you come to work here, what are we going to offer you that's more than just an exchange of money for your time. 0:07:19.0 Right? We're going to hire you to do a job, you know, we're going to hire you to do your very best work. It's going to be challenging, but one of the things you're going to get by working here that are bigger than just doing the job. So we spent a lot of time on that. 0:07:32.0 Number two, we spend a lot of time marketing the career pathing and pay potential and earnings growth here. And so, candidates who apply here and make it to the interview stage, we basically are selling to them the opportunity here. Recruiting is a sales process. It's not an administrative function. It's a selling process. And you're trying to get someone who's probably quite successful in a stable job that's happy, trying to make a major life decision to take a risk and come work for you, and you really have to treat it like a selling process. And so we spent a lot of time on that. 0:08:09.5 Which means we've created formal marketing documents and process, and we manage the heck out of it. 0:08:22.5 And then third, we really have reduced the number of rules in the company to only the bare minimum required by law. 0:08:25.5 And so, you know, if I could boil it all down, it's basically: Be responsible and do your work. That's really the only two things we expect of people. So people can work from home, you can work from Argentina, I don't care. We don't care what the hours are unless your job really requires you to be working when our customers are working. But other than that, it's really – your life is your choice, you can do what you want, let's do great work, let's get the job done. 0:08:53.8 And all those things together combine to make our employment brand, I think pretty strong, in our minds. Andy: 0:08:56.7 Yeah, I mean it seems like it. But one thing I'm curious about, because I know that there are a lot of listeners who are tuning into this and maybe asking themselves, “That makes sense, but we're still a small team, we don't have leaders of management. We don't really have a clearly defined career path, because those are just so far out into the future” and so much can change for them. So, if a startup is still in some of those early stages, how can they add some stability, or at least predictability to some of those elements where they're not quite sure what their future looks like yet? Adam: 0:09:28.1 Well, you can start from day one. I remember when we were starting this business, the very first thing we did before we decided what we were going to offer to the market, is we defined the core values of the business. Myself and our two cofounders. The very first meeting, and I still have the notes from that meeting. 0:09:47.9 We decided what we stood for. Who are we? What are the non-negotiable values of this business. 0:09:54.5 So from day one, it's always been intentional. And you know, that costs zero money. It just costs time. You can do it. Having an unlimited PTO policy 0:10:03.2 from day one actually saved us money. But it also saved us a lot of administrative overhead and management and it also helped people feel comfortable that we trusted them. 0:10:15.4 That was something that was very easy to do. Being really transparent with how the business was going. Sharing everything with everybody. Complete open book. That doesn't cost money, but it sure adds a ton of value to your brand as an employer and to the culture of the business if that's what you're trying to do. So there are all kinds of things that a one or two person company out there, thinking about that first or second hire, or you're just getting to that point of scale where you're thinking about either raising money or pressing the growth pedal, you can do it. It doesn't cost a lot of dollars. We don't spend a lot of money on this stuff. We do spend a lot of time and intention on it. Where it doesn't necessarily have to be that kind of Jack Welchian about the exact org structure. But you can talk about where things are going, where you want them to go and where they are at right now and still have a lot of transparency that helps build that brand. 0:11:28.2 So that makes a lot of sense to me, I'm glad you clarified there. 0:11:32.1 But once startups, once these founders, this early team has a good idea of that side of things, what's the next step. Adam: 0:11:40.6 Well, the next step is to implement process. You have to define your company's recruiting process and how you're going to manage it. Just like you would with your sales process, your customer's success process. 0:11:51.7 These are product development processes. If you want a predictable result, you have to follow a predefined process, and you have to manage it and report against it. 0:12:01.2 Most companies don't do that with recruiting until it's far too late. And so, number one, have a process. It could be the world's most simple process, but just controlling it reduces the variability as you work to build your team and when you control variability you can improve your hiring results by as much as 40% just by following the same process every time. 0:12:26.2 And the research has – even if it's not the perfect process, just the same one makes all the difference. So that would be step one, is to just decide how you want to do it. Andy: 0:12:33.0 And I mean, that's the thing where a lot of people in any business, in any company, but a lot of times in the earlier stages of startups, you see people almost resist process. They're resisting what they find as the corporatization of business and they don't want that. But if you don't have any processes, even like you said, if it's very simple – any process in place, you're just rolling the dice. You're just hoping that things work out and that you produce a good result. But that's, like you said, if you're not measuring against it, if you don't have something in place, it's really hard to improve and you're not going to be able to produce that predictable result. 0:13:11.5 Which for hiring you need to have. Adam: 0:13:13.4 Yeah, that's correct. I mean, I liken it to the TSA process at airports. Is that process yield security or does it just produce the illusion of security. Is your recruiting process really a process that produces the result you want or does it just make you feel good that you're putting people through the rigours of taking tests and answering questions you just made up. 0:13:36.5 It really matters what your process is. It really, really matters. 0:13:40.0 And you don't need to be a big business. In fact, I would say it's never more important to put the right people on the team than those first five or six hires. That really makes or breaks your trajectory. 0:13:53.9 And getting the first couple of hires wrong out of five or six cripples your cash flow and your growth. It can be irrecoverable. Andy: 0:14:02.3 Yeah. And it's – when time is truly of essence in those early days, it's not as simple as like, you're not going to know right away when you made the wrong hire. It's going to take months and months of probably second guessing and then maybe eventually letting them go. And that's lost time. Time that you really didn't have to lose in those early days. 0:14:21.4 But once you've started putting down some ideas for the process and you've said, “Alright, this is how we're going to approach this problem,” where do you go then? At what point should you be thinking of prioritizing what you're hiring for, who you're hiring for. Like, where would you go or think to define, like, these are the roles I want to hire for first? How do you prioritize all of that? Adam: 0:14:46.9 Well when you're early stage, the rule of thumb is do not hire for the position until the pain of not having the person in that role is so great that it's causing serious brain damage to the team or hampering growth or success of the business. 0:15:02.8 You know, particularly for companies that have raised some money. They can over hire quickly. And when they do that, they often, you know, pull the trigger a little too quickly and end up with roles that are not well thought out, or what I call, Tweener roles, which are combinations of things that don't really make a lot of sense. 0:15:22.8 And you can light a pile of money on fire doing it that way. 0:15:27.2 So rule number one is, until your hair is on fire, you probably don't need to hire somebody. But as you grow, you know, those criteria change. You move from hiring utility players that can do it all to hiring specialists who add very specific value to very specific parts of the business. And you know you start to do that, I would say right around 40-50 employees – is really where you move from this, “I need utility players to I need specialists”. In my experience and observation. Andy: 0:15:59.6 Ok. That makes a lot of sense. And once you do have a good idea of, alright you've taken a step back and you realize these are the places in our business that we need help, that are constantly causing issues or that are acting as a bottleneck for us continuing to grow. And you know where you want to hire, where do you start finding people? Because a lot of companies out there just rely, especially in those early days, just rely on their network and the network of the cofounders and that's about it. Maybe if they have a mentor and advisor they can tap into that, but is that enough? Adam: 0:16:34.2 Well, those networks are the most important networks at all stages. You're always going to get the best result from referrals from within your network or the network of the employees that work in your business. 0:16:46.7 So I would say that, from a quality standpoint and a tenure and retention standpoint, what the data shows is that referrals are the best source for both reasons. 0:16:58.1 The worst way to do it would be to rely on job boards. Right? Where you're doing the post and pray method where you post the job and hope people apply. That's high volume, low quality, high time consumption recruiting. 0:17:11.9 The best way, that's a combination, a little bit of the two, is to build your own employment brand through a dedicated career site linked to your company. Right? So if I am, you know, AcmeSoftware.com and I'm interested in building my employment brand, I would have /careers.acme.com and I'm putting everything I can into a dedicated microsite or section on my site talking all about our company and what it's like to work here. I'm going as far into it as I possibly can. 0:17:49.5 I'm making videos, I'm making sure the copy's there. I want somebody to look at the company, see a day in the life, look at the career path thing. I'm going to try and publish as much of that as I possibly can. 0:18:00.8 Really give someone a sense of what it means to work here, because what we find is, you know, across our customer base of nearly 5,000 customers, candidates, you know, spend in average of 30 minutes researching your career site if you have one. And if you don't have one, they're going to move on to the company that does. But that brand, as I said before, will do two things. It'll either get them to opt in or get them to walk away. When people opt in after they've seen your brand, they're much more likely to be a fit. They're much more likely to be the kind of quality that you're looking for. They're much more likely to stay. 0:18:38.4 It's the equivalent of getting a super warm sales lead that comes across that doesn't happen enough for your sales team. You usually have more – it's the same kind of a thing. Your career site will generate leads. 0:18:55.0 The other point I want to make is that the way in the search engines are leveraging job opportunities and inventorying them and displaying them is changing very rapidly. Facebook is now in the jobs business. Google is now in the jobs business. The game is changing pretty substantially and will favour companies with strong, organic career site content and presence, particularly video, over third-party lead listings from job boards that you may know. Andy: 0:19:25.3 I didn't even think about that. It's – and I think viewing the career page, viewing your job page, as something that should get resources to it, to improving it and to making it up to par, is something honestly I hadn't really thought about. For so many companies I know, it's pretty much an afterthought. But just like your website needs to sell your software, it needs to act as a 24/7 sales person, that career page needs to sell the company to potential applicants. Adam: 0:19:58.1 Absolutely. Well here's the other thing. Your customers and prospects will look at it too. And your customers want to know they're working with a company that treats people well and that cares about hiring the best. And what we find is, traffic to the career site lifts traffic to your consumer or B2B site and actually can lead to higher customer satisfaction down the road. We've seen linkage between employment brand quality and perception of the quality of the company. And you can measure that through ratings like you find on Glassdoor 0:20:36.2. Andy: 0:20:38.4 That's really cool. And it makes sense though. And especially, I think you're going to see for earlier companies – it also just shows that they're taking things seriously. That they're really investing and in the future of the company. Because that's one of the biggest concerns that any startup is going to face when they start to get out there and sell is, “Are you going to be around? How do I know you're worth taking the risk on for trying out your software?” And so when can show that you're really investing in your team and you're taking it seriously, I think it builds on all of that. So that's a really cool perspective I truly hadn't thought about. Adam: 0:21:13.8 We see it across industry verticals. So you know, whether you're in a business services or software or you're in the fitness business or some kind of an accounting firm or home health care, it – when they sell cars, it doesn't matter. It's all related. Employment brand leads to higher quality applicants, it leads to a lift in your consumer facing brand and leads to higher sales, higher customer satisfaction and retention. Andy: 0:21:40.1 That's really cool. And so, I would love to dive into that, but let's for the sake of brevity at least, let's go on to the next step. So we've got this high performing site, we have our network, we have everything working towards us to get good leads coming in to our hiring funnel I guess you could call it, how do we actually interview them? Because this is something, especially from the developer side of things, the software engineer side of things, there is so much out there about how the interview process is broken. 0:22:09.4 So how can a company fix that? How can they make sure they're interviewing properly and ultimately selecting the right person for the job? 0:22:39.6 So the question to ask is, “If I hire this person, what will have happened 12 months from now such that I can answer the question, 'yes I'm really happy. '” And write those outcomes down. And this is the difference between a job profile and a job description. 0:22:54.3 So a job description, you would say, “Cold call prospects to generate warm leads. Generate proposals, close business.” That's a job description. 0:23:05.0 An outcome is, “Generate an average of 20 proposals per month, each month for 12 months on average. Generate $500,000 dollars in commission over gross margin”, or whatever the measurement is. If it's an accounting role or someone in accounts receivable, “Maintain a daily day sales outstanding receivables balance of 50 days or less on average over a 12 month period.” That's an outcome. 0:23:41.5And when you know what the outcomes are, you can then create interview questions to elicit whether or not that person has one, not only delivered outcomes like that before, but number two, have been able to deliver those outcomes working in an environment with similar value systems and culture that you have in your company. 0:23:51.5 And that's really the critical link. So what am I looking for from an outcome standpoint in various points of time, and then has this person achieved those outcomes doing it the way we do it. 0:24:07.6 And if somebody has been able to work in a similar environment and achieve similar outcomes and they have a similar value system, then we're 80% of the way there. And then you can be really honest in an interview and say, “Look, we really don't know what we're doing with this particular part of the business and we're looking for somebody that has the ability to turn chaos into process.” And I want to understand when that person has taken nothing and turned it into something. We're taking a lack of process and turned it a into process driven situation. Right. 0:25:21.7 I want to look for the outcome. Where have you lived through something similar? If I'm looking for a utility player that can be a jack-of-all-trades, I want to know that this person has been that and done that before. Andy: 0:25:33.4 That makes a ton of sense, because it's not so much that you're taking a chance on somebody to do a job you've already defined, it's that you're going back to how you define the roll. If you're at the stage of the company where you know exactly what this person needs to come in and do, the playbook has been built, it's been improved, it's been tested, then you probably shouldn't really be taking those chances. But, if you're still in those earlier days and figuring things out, that's when you should define the role around, but you still need to make sure that the person you're hiring has shown an ability in the past to meet similar challenges. Andy: 0:26:11.7 And so, one thing I'm curious about, is you mentioned setting, kind of, time goals based on different milestones. Say one month, six months, a year, into someone's time on board to make you feel comfortable saying that you hired the right person. Once you actually hire that person, are you going back and evaluating them by those standards? Adam: 0:26:34.1 That's exactly right. That's the key. So what I like to do at the end of the interview process for somebody in any really professional role, is to say to them, “Hey look, what I'd really like to get to is a plan for the first 90 days of your time here. 0:28:03.5 If I start to see things being missed at 30 days and then at 60 days, by 60 days I'm pretty sure that this person's either not going to work out, or that the person whose managing them, and that could very well have been me back in the day, is not doing a proper job of giving them what they need. And so we'll have that conversation. 0:28:24.6 But if the person's failing to meet the promises they've made, and that happens three months in a row, it's easy for me to make a quick decision. And I'll give someone 90 days, but at 90 days, if it's not working then we will rip the bandaid off and just let them know this is not the place for them. You know, let's help them be successful somewhere else. Andy: 0:28:43.7 And I'm guessing that, well it's not even much of a guess, but if people follow the steps that you've laid out, it's going to lower the chances of hiring the wrong person. But at this point, once you have hired somebody and you're now evaluating them based on those agreed upon goals. How often, or how common is it to have to let someone go because they're not the right fit? Adam: 0:29:07.5 Companies that are absolutely best in class at hiring can get it right seven, maybe eight times out of ten. So, best case scenario, you're looking at 25% non-regrettable attrition, meaning we're glad they're not here anymore, on an annual basis. That's pretty healthy. A 25% turnover rate, that's pretty healthy. When you start getting in to the 10-15% range, my question is, “Are you being hard enough on people? Are you – maybe things aren't being managed properly.” Because you know you get below 20%, it just starts to be outside of the normal data set that I see being successful for high growth, early stage companies. 0:30:01.2 So, if you're at 25% non-regrettable attrition, you're in really good shape. Most companies I see have really low attrition until they get to about 15-20 employees and then they haven't put the management processes in place to scale beyond that. Then from 20-50 you see all kinds of ugly start to happen. And if they don't fix it by 50, that's when companies light their investors money on fire and come back not having into the evaluation that they needed to meet to get to the next round. 0:30:32.6 And it all comes from the fact that they just haven't put the rigour into the hiring process. Andy: 0:30:38.3 That's an interesting way of looking at it because it reminds me there's a lot of similar analogies you can make, but the common one in my mind is for real estate investors who say, own rental properties. They might brag about having zero vacancy rate, but that means they're probably not being aggressive enough at raising their rents. And obviously you can get deeper into the equation than that, but it's similar. If you have almost zero turnover and you're hiring quickly, you do probably need to take a look to see if you're being stripped enough. Or at least holding people accountable enough to the standards that you want them to meet. Adam: 0:31:19.5 Yeah, absolutely. And I would say when it starts to get alarming is when your regrettable attrition rate is somewhere around 25% or greater. That means people I'd rather keep leave of their own free will. Then something's going on. Right? 0:31:41.5 And you look into it. “Well why are good people leaving? Are they working for people that they don't feel they have their best interest in mind?” Which, by the way, is the number one reason A-players leave organizations, because they don't feel their manager has their best interest in mind. So there's a trust issue there. Is that happening? Are we paying people enough? Do people understand the vision? Do people know where we're going? Have I as the leader described that in a way that can help people buy into where we're going? High levels of regrettable attrition can be a death sentence for an organization and you can find out what's going on by reading the Glassdoor reviews. 0:32:20.8 I mean, I'm on there every day pretty religiously. I would say it's – every CEO should be watching that like a hawk. Andy: 0:32:26.6 Yeah, because you can make all these investments in hiring the right people, but if you're not able to keep them, it's not going to be much good in the long run. Adam: 0:32:34.2 Right. It's just like your value or brand promise to your customers. You've got an employee value proposition that you've developed, and you're selling it to get people to buy in and come to work for you. And if you do not deliver on your value prop, they will leave. 0:32:51.1 And if there's a disconnect between what you're promising and what they're getting or experiencing when they work for you, that is a leadership issue. Andy: 0:33:00.3 Yeah. I mean, you gave us a ton on that and again, I could've talked with you for hours about all the intricacies of that, but that was a really good primer on what really does go into building a proper and effective hiring process. 0:33:14.9 But at this point I kind of want to take a step back and just talk a little bit about your business before we wrap up. And so just, what does the future look like for Hireology? Adam: 0:33:22.8 Well when you look at the US economy, there are about 7 million businesses in the United States with employees. Of those 7 million businesses, 1.5 million – as many as 2 million have been a part of what I would call a branded de-centralized network. They are manufactures, dealer network, they're part of a franchise system, they're an agent network like insurance or real estate or financial services, so almost a third of US employment flows through one of these main street small businesses that are part of one of these branded networks. There's nobody in the space helping those operators be good at the people side of their business. 0:34:11.3 I mean, Hireology is really – we're on our way with some of these verticals in these markets. We're in a few thousand out of 1.5 million – we're going to keep doing what we're doing, we just have to execute the heck out of this and just make sure that we put the right people in place, they understand the vision and we're giving them tools to succeed. We're just going to stay heads down and grow this business. 0:34:33.8 I think we're in a position to be the far and away leader in this emerging growth category that most vendors just aren't looking at right now. Andy: 0:34:44.6 And for you, is it simply a matter of execution, or what do you see as the biggest challenge to getting to these aggressive growth goals that you have? Adam: 0:34:53.5 Well, if you'd asked me that question 12 months ago I would say I didn't have the right management team in place in order to truly scale into a growth stage company. And over the last 12 months, we have almost completely overhauled the management team, moved some folks around, brought some new people in, moved some people into different roles and I turned over day-to-day operations of the business to a Chief Operating Officer in January of this year. 0:35:20.7 It has made all the difference in the world. So, I can be doing what I'm best at, be the external voice at the vision, put the right people in place, be the evangelist, be the face of the business and Julie, our Chief Operating Officer can do what she was born to do, which is manage the heck out of this thing and make us operational efficient and tight. 0:35:43.2 And execute the plan. And since I've done that, the growth rate has accelerated, our success is accelerated in the markets that we're in. And giving away that control is absolutely the best decision I've ever made in the history of this business. So I would say – so now that we're in that position, what happens next is it's the efficient application of resources. 0:36:10.2 So you know, you can't continue to just throw money on the business. As it scales you start to have to really drive efficiency and scale and leverage through the investments that you've already made. And so we're just hyper focused on efficiency metrics and that has compelled us to make a sizeable investment in an internal ops team and business intelligence and analytics. 0:36:34.5 And if we don't have the data, we can't make good choices. And so that for us is really the next frontier for how we scale the business. It's operational soundness that comes through data, internal process management. Which are things that I can wake up in the middle of the night in a cold sweat and a nightmare as the person responsible for that. I'm glad we have people here that do that. I am not that guy. But we have those people here now. And it's made all the difference for us. Andy: 0:37:01.1 Yeah, I mean it's always exciting for me to talk to different entrepreneurs at different stages of the business to see what challenges they most recently overcame and what ones they're working on right now. I mean, as an outsider, I”m going to be pretty excited to see how you guys do over the next 12 months, because it does seem like you're entering a different stage. And to me at least, it looks like you have most of the things in a line to really get this. I'm excited to see how that goes. But to tie it all together, 0:37:30. What advice do you wish someone gave you back – I know over the years you've recruited and hired probably hundreds or thousands of people, so when you first started getting that authority to make hiring decisions, what advice do you wish someone gave you then? Adam: 0:37:45.2 This is gonna sound antithetical because of the rigorous process I just advocated for, but if something feels off, just don't hire the person. Just say no. At any point, before you make the decision, or even after, something feels off, just walk away. There is – I can count maybe on one or two fingers the number of times that I thought I made a bad hiring decision and it's turned around. It never turns around. Anytime I've had my gut say, “You know what, this person looks great, but I'm just not feeling it.” And I did it anyways, it's always – it's always failed at some point down the road for the reason I thought it would. Listen to your gut, humans beings have a highly tuned sense of intuition. We don't realize how much data and input we process through verbal and non verbal cues in a situation. If something feels funky, it's your experience and pattern recognition over the course of your life telling you something's off. 0:38:48.0 It is absolutely an accurate predictor in tie-breaker situations. Andy: Awesome. 0:38:57.3 So before we wrap up, I like to ask all of my guests just a few rapid fire questions and so I'm going to go through them pretty quickly, but your answers don't have to be that short. 0:39:06.2 And the first one is just, currently, what do you find yourself spending too much time doing? Adam: 0:39:13.8 That's a good question. I find myself spending too much time fighting multiple technology systems to get answers. We need to be doing a better job aggregating data into dashboards across the business as it grows so that we can spend time on decision making and not on digging up information. Andy: 0:39:37.8 And then, what do you not spend enough time doing? It sort of builds on what you just talked about, but I'm curious to hear your answer. Adam: 0:39:47.0 I don't think I can ever spend enough time doing two things. Number one, sitting with customers and watching how they use our platform and making sure we're adding value. And number two, being in the talent pool convincing that next great person that they want to work for us. Andy: 0:40:01.6 And we had talked a little bit about the bigger picture goals for Hireology, but what are you hoping to accomplish in the next quarter? Adam: 0:40:08.6 Very, very specifically, we are launching a new product that I believe has the potential to double our revenue per account in the next six to eight months. So, it's a big deal, it's a big initiative. Early returns are good and we've got to execute really well in a short time frame to hit some deadlines that are just based on the revenue cycle of our customers. Like this thing's got to be on the market in the fourth quarter or we're going to miss 7-8% of the opportunity for the next 12 months. So we are hyper focused on getting that out the door. It is a big win if we do it and so this quarter, we just have to get that done. We're marshalling all resources around that effort. Andy: 0:40:51.6 And so the biggest obstacle to achieving that is really just executing and living up to those deadlines? Adam: 0:40:57.6 Yes. Which, and I would say the biggest obstacle to executing it would be our – if we had the inability to say no to really exciting opportunities that pop along the way. So it's just the discipline to say, “You know what, that's interesting, but it's not what we're doing right now.” Right? To walk away from really awesome, equally exciting opportunities that we just can't prioritize at this time. We just can't chase shiny stuff. We've got to get this done. Andy: 0:41:31.6 Adam, this interview has been filled with bits of wisdom throughout it. Honestly, I am excited to go through it again myself. We're putting it into show notes, but I'm sure all the listeners got a lot out of that. But if listeners did get a lot out of that, they are excited to hear from you and hear what you have to say, where is the best place for them to go to hear more from you. Or even just to see what you're up to at Hireology? Adam: 0:41:52.7 Well, so I write at my personal blog site, which is www.thebestteamwins.com. It's got my book, audio, ebook and hardcover as well as my blog. My own podcast, “The Best Team Wins” is linked there. So I talk about all the things we just discussed there. And then more on Hireology at www.Hireology.com. Andy: 0:42:18.6 Awesome, I'll make sure to get all of that linked up in the show notes. And Adam, thank you so much for your time, it was a lot of fun chatting. Adam: Yeah, great interview, thank you very much.